Every cell in our body produces tens of thousands of free radicals on a daily basis. From a long-term perspective, the oxidation that inevitably results can have a devastating effect on the integrity of our healthy cells. 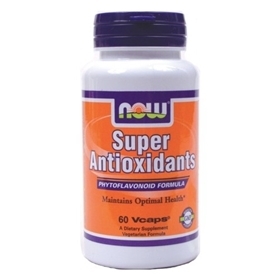 NOW Super Antioxidants are comprised of the most powerful oxidation quenching nutrients available today. Countering the effects of oxidation provides us with greater amounts of energy, increased stamina, and a better state of overall health. Our distinctive blend of these highly effective free radical fighters can play a substantial role in warding off some of life’s most damaging toxins. With aging, your body tissues suffer from oxidative stress due to the process of oxidation. This occurs when molecules within your body lose electrons to electricallycharged molecules of oxygen in the blood.. These molecules are called free radicals, and they cause damage to cellular DNA, and over time, this damage can become irreversible and lead to different diseases. Oxidation is a natural process that happens to everyone. The more free radicals build up in your body, the more oxidative stress will occur.Free radicals steal electrons from the proteins in your body, which badly damages your DNA and other cell structures. Antioxdants are the answer to this damage, and they are necessary to keep the levels of free radicals in your body low and maintain good health.As you age, your body's natural defenses against oxidation, free radicals and oxidative stress become less effective. Researchers agress that a high level of antioxidants can prevent many age-related diseases. Antioxidants benefit your health by neutralizing free radicals in your cells. They have a range of health benefits including reducing the signs of aging by minimizing wrinkles and preserving the texture of the skin. Different antioxidants benefit different parts of the body. For instance, beta carotene can help maintain eye health, and lycopene contributes to prostate health. Flavonoids found in tea, cocoa and chocolate are good for your heart, while the proanthocyanidins found in cranberries is very helpful in the maintenance of the urinary tract. Repairing damaged molecules – Some types of antioxidants can repair damaged molecules by donating a hydrogen atom, very important when the molecule iscritical, like in your DNA. Blocking metal radical production – Other antioxidants have a chelating effect, meaning they can grab toxic metals like mercury, lead, & arsenic, which can cause free radical formation, and remove them to prevent any chemical reaction from taking place. Stimulating gene expression and antioxidant production – Some antioxidants can stimulate your body's genes and increase your natural defenses. Providing a Protective effect – Antioxidants, such as flavonoids, can act as a virtual shield by attaching to your DNA to protect it from free radicals attacks. Promoting cancer cells to commit suicide – Some antioxidants can provide anti-cancer chemicals that halt cancer growth and actually force some cancer cells to self-destruct, a reaction known as apoptosis.Ridding the body of bad cells is a big part of staying disease free. Suggested Use: As an herbal dietary supplement, take 2 Vcaps® 1 to 2 times daily. Free of:Sugar, salt, yeast, wheat, gluten, corn, soy, egg or milk or preservatives. Other Ingredients: Cellulose (capsule), Rice Flour, Magnesium Stearate (vegetable source) and Silica. Vegetarian Formula.